I haven't been this excited about a dress in quite some time. 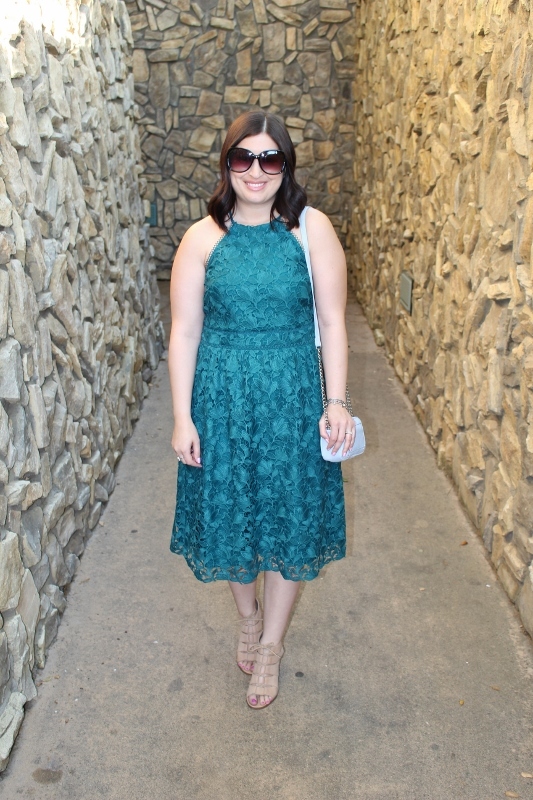 The vibrant green color, the quality of the lace, the halter style, and the midi length all had my attention and I knew when it was 40 percent off that it had to be mine. You never know when you'll need a versatile dress such as this one. Hinge heels, love these on sale! Lips in M.A.C. "Shy Girl"
This is EXACTLY what I wore in Hollywood a couple weekends ago when my best friend and I went out to SUR and Pump. And I mean exactly! 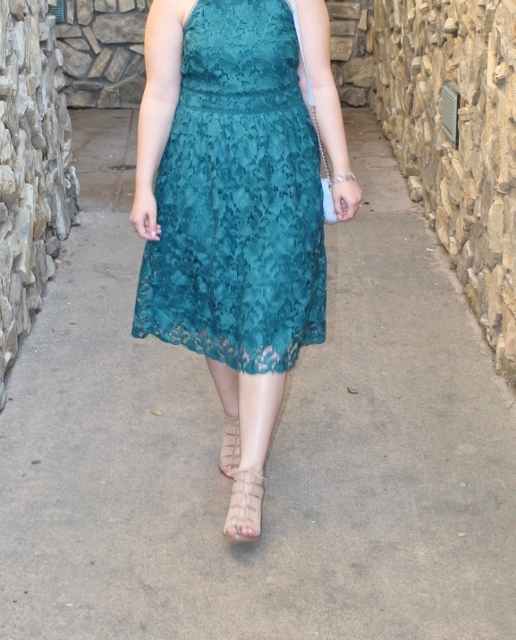 I wanted to recreate this look for you ladies because the dress is still available, and I really enjoyed pairing it with these trendy lace-up heels and a darling little baby blue bag. I tend to stick to nudes when it comes to more vivid outfits but I think an unexpected color combination makes things much more interesting. Before I let you get on with your day, I just want to say that I didn't blog last week because I didn't have any content and I don't like feeling pressured to put out something in haste. I hope you understand! I still plan on sticking with Mondays and Wednesdays so I will be back tomorrow with another outfit, albeit much more casual than this one. Also, I know some people who are going through a tough time right now so let's all please keep things in perspective. you look gorgeous in that little dress and I just love the length of it. I saw this in store, and I loved it! I would have bought it, but I didn't have a reason to wear it. So glad you got it. Gorgeous on you. No pressure to post here. I'm glad you post when you feel like it is a good fit for you. I sometimes have to skip my Monday blog post for some reason or another. It helps to remind myself that it's just a blog and just for fun for me. That dress is beautiful and I love the color on you! 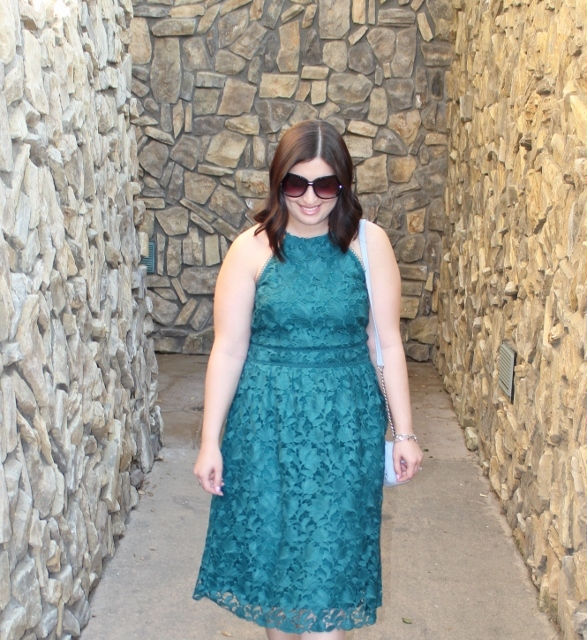 I was eyeing that dress just the other day - I love the rich teal shade they chose for spring, and you can't go wrong with a good thick lace. 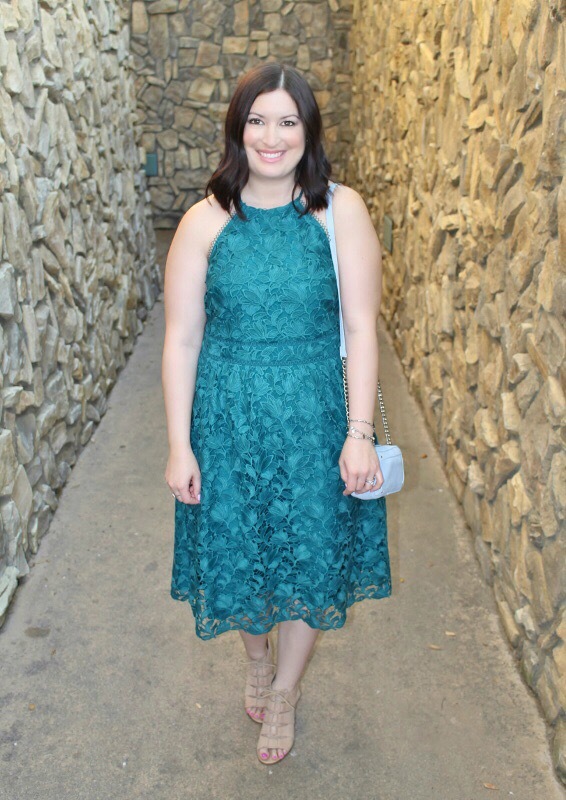 That dress is gorgeous and an incredibly flattering shade on you! (Actually I'm wondering if there's any skintone that it wouldn't flatter? Hard to imagine!) So glad you found a reason to wear it AND that you went the extra mile to re-create the outfit to share. It was worth it! Can you do an updated skincare routine? It's flawless! I like that you aren't ultra tanned like many fashion bloggers. It's really refreshing because I have pale skin too. Thanks!